One year ago is when it all began. On June 10, my sons and I went to Czech Village in Cedar Rapids to see if we could offer any help in sandbagging efforts. We encountered a flurry of activity, even though no one knew exactly what was coming. Later, we offered our help to Kather Alter, a Gazette employee who was evacuating from the Time Check neighborhood. Looking back, there was so much more I wish we had done. The historic Cedar River flood ended up affecting not only Czech Village, Time Check and other areas abutting the river, but places I never thought would be touched, including my mother’s home. The Gazette, in downtown Cedar Rapids, was also affected, even though we stayed above the floodwaters. Here are some of the photos I captured during those days in June 2008. To be fair, this is me in the same spot on the Gazette's back dock - no shower for days because of the city's water restrictions. Skylar Strawn, 11, of Cedar Rapids, with his award winning smallest mushroom, (in the plastic bag, attached to the larger one) which he estimated at 1/2-centimeter. Butch and Toni Velky of Swisher, with most unusual winner - 6 mushrooms growing together - which they dubbed "Bohemie Six-Pack"
Tom Slade, Solon, and Tyson Gosnell, Shellsburg, carry away their best display award winner, which included at least 250 morels. The two revealed where they found them: "In the woods." There was no award for cutest display, but Debbie Eickstaedt and Theresa Shaver of Cedar Rapids undoubtedly would have won with this fawn. Looks like the weather was right for these morels, which are actually carved out of pine wood by Ron Takes (in tan jacket) and Tom Brislawn of Troy Mills. Blonde morels/ photo from Forest Mushrooms Inc. I can finally say I’ve found some morel mushrooms! Actually, I didn’t have to go on a mushroom hunt, as many Iowans do in the spring, though I’d love to find them that way. The ones I saw were spotted at a grocery store in Cedar Rapids. They were selling for $12.99 for a 3.5 ounce package and came from Forest Mushrooms Inc., of St. Joseph, Minn. Here is more that Kevin Doyle, president of Forest Mushrooms, Inc., sent to me about his company and his insight into morels: All morel mushrooms are wild-harvested, not cultivated. There have been many attempts to grow morels, and some occasional successes but nobody has been able to repeat their successes, and thus there are no farms that currently grow morels, to the best of my knowledge. This is because there is a very complicated and interesting relationship between the morel mushroom mycelium (which are the vegetative strands of the fungus that grow underground), and the root hairs of the trees that are host to them. We think that the strands of morel mycelium help the tree to absorb nutrients from the soil, especially minerals, by carrying the minerals through the mycelium and then inserting the mycelium and the nutrients in to the tiny root hairs of the tree roots. The mycelium is much much smaller than the root hairs, and wrap themselves around the root hairs and then penetrate into the root. In turn, the morels likely absorb some carbohydrate (sugars) from the vascular tissue of the tree roots, so they relationship is helpful to both organisms. However, there are conditions, including but not limited to damage to the tree from fire, Dutch elm disease, wind damage, etc., that cause the morel mushroom mycelium to send strands of mycelium to the fungus where they then produce the specialized reproductive organ that we know as a mushroom. That mushroom then produces spores which are dispersed by the wind and are carried away to start a new colony in another area of the forest, thus propagating the life of the morel fungus. This is an adaptive response that has developed through evolution to help the fungus survive adverse situations or events. The mushroom is just a specialized part of the fungus’ life cycle, but the main act occurs way underground for decades and helps to sustain the trees themselves, thus morel mushrooms and also many other types of mushroom fungus are essential to the health of a sustainableforest ecosystem. The morels in North America are widespread, though we in the Midwest often think of them as a local phenomenon. In fact, the morel season begins much earlier in almost every other area of the country than it does in the upper Midwest, due to the milder climates and earlier onset of Spring in other regions. In the Pacific Northwest the morel season begins in late March, and can actually continue right on into early August in the higher elevations of the Rocky Mountains. In Minnesota, where our business is located, we are used to seeing morels during the second half of May, typically. I would imagine in your region it is the beginning of May most commonly. During the milder and earlier Springs we were having a few years ago, the season began a bit earlier. The season is triggered by the combination of adequate soil moisture and enough sunny days and warm temperatures to warm up the soil adequately to spur the growth of the mushrooms. There have been years when the moisture is there, but the temperatures are too chilly, and by the time the mushrooms come up as temperatures warm up, the grass and small plants in the forest have already sprung up and obscure the mushrooms from view, so people think there is no mushroom season, when actually we just can’t find them under the forest floor cover! Packaged mushrooms from Forest Mushrooms, Inc.
the Rocky Mountains in Oregon. These are the best morels in the country at this time, for flavor, appearance, and shelf life. They are also similar in appearance to the mushrooms that we commonly see in the Midwest. Later in the Spring there are several other varieties that grow in abundance in the Pacific Northwest, including “fire morels” (also called “burns”), which grow in huge numbers on the sites of last season’s forest fires. These burn morels are smaller, not as thick, and have a conical shape. Another morel commonly harvested commercially in the mountains is simply called a “natural” and is shaped more like a golf-ball, without the conical shape and more rounded, with a thicker shell. (All true morels are hollow inside.) The latest morelspecies to fruit in the Rockies is called the “grey morel” and can also grow on fire sites. It is the largest morel in the country, grey in color, thick walled, and has a great shelf life for transport to market. All of these morels are also dried, often on-site, or in large gas-fired driers, for preservation and enjoyment in the off-months. Forest Mushrooms flies in morels, as well as many other wild-harvested mushrooms, every few days all year around. We inspect and sort them, and then market them to both the foodservice and grocery store markets. We are licensed as “Wild Mushroom Experts” by the State of Minnesota, which is required for the commercial handling and sale of wild-harvested mushrooms. Any establishment in Minnesota that sells wild-harvested mushrooms of any type, including morels, to the public, needs to be able to show that they were obtained through a state-licensed Wild Mushroom Expert. I do not know whether Iowa has any such requirement, since this varies from state to state. But it does provide a measure of food safety and confidence for chains when they chose to carry these products. FYI, Forest Mushrooms, Inc. has been in operation since 1985, and we specialize in growing oyster and shiitake mushrooms (about 3000 lbs/wk, all year aound) and in distributing all other specialty mushrooms, fresh, dried and frozen, both cultivated and wild-harvested. We also have a full line of organic fresh mushrooms for both foodservice and grocery customers. We do NOT sell to the public directly, but are strictly growers and wholesale suppliers. The annual Czech Village Houby Days celebrates the mushroom (houby is the Czech word for mushroom) and I’ve heard they might go back to using morels in their breakfast!! 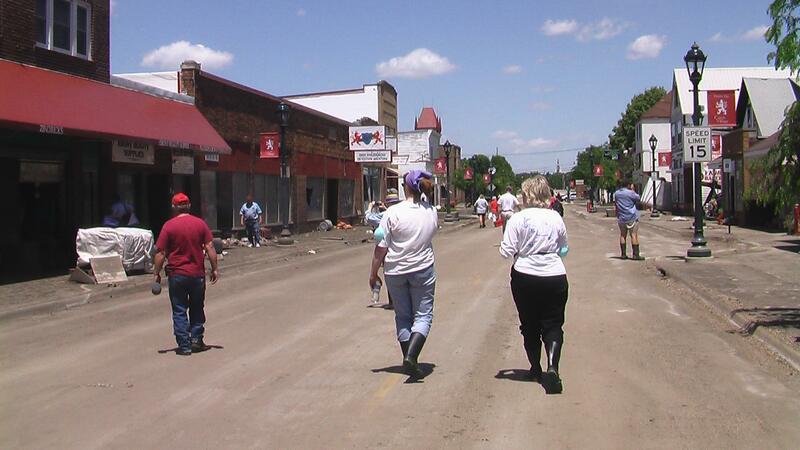 About half of the businesses in Czech Village have returned since the flood and more are hoping to come back in time for the celebration on May 15-17. Below is a photo of Jan Stoffer, of the National Czech & Slovak Museum & Library, giving a tour of Czech Village to students from McKinley Middle School last month. Jan Stoffer leads tour of Czech Village for McKinley students. You can click on a shop to see a photo and its status – whether or not its rebuilding (though we do need to update with the opening of Sykora Bakery.) You can also send in your own comments and memories of the businesses or add what you know about a building’s history. Ann Rocarek, daughter of Sykora Bakery owner John Rocarek, fills pastries with apricot filling in the bakery's kitchen. Gov. Chet Culver talks to Jan Stoffer (in black) and Gail Naughton, both of the National Czech & Slovak Museum & Library, along with Jan's twins. Bessie Dugena, left, a Czech Village business owner and former resident of the Czech Village neighborhood, talks to Gov. Chet Culver. Gov. Chet Culver, left, talks to Cedar Rapids Mayor Kay Halloran, in red. Carly Mark, 10, and Victor Mark, 12, of Van Horne, outside Sykora Bakery. Call me a gardening geek, but yes, that is a photo of some of my sweet potatoes, which we finished eating just a couple months ago. I took the picture because a) they were the first sweet potatoes I had ever grown and b) they might have been one of the last relics of a business that fell victim to June’s devastating flood in Cedar Rapids. I bought the sweet potato plant in May from Ray’s Market, near Czech Village in Cedar Rapids, just weeks before the flood that devastated not only Czech Village and my old neighborhood near Ray’s Market, but many other parts of the city. It took me awhile to track down Ray’s Market owner Fran Smith, someone I didn’t even know by name before the flood. She was hesitant to talk about what happened and who could blame her. Not only had she lost her business, a longtime icon at Bowling and C streets SW, but her son, who worked in the store with her, nearly lost his life around the same time. Lynn Smith had to have his leg amputated after he was hospitalized with pneumonia and an infection right before the flood. He and his wife, Karren, lived in a home behind Ray’s Market. The family has been through a harrowing year, but Lynn pulled through his illness. Fran decided against the burdensome cost of rebuilding Ray’s Market. I’m sure many people will miss the blooming petunias and other bedding plants that lined the front of the shop come springtime. And I’ll have to track down another sweet potato plant elsewhere. In the meantime, you can catch up with Fran and her mother, who sell homemade jelly, jams, floral arrangements and aprons, at Cedar Rapids farmers markets. Fran also said she would consider selling Ray’s Market, as well as the house behind it. Although the business is in shambles, the home can be rebuilt. More on their story is in the Friday, Feb. 27, 2009, issue of The Gazette. We’re diverging from our gardens a bit to address questions I’ve been hearing about Czech Village in Cedar Rapids, one of the area’s hardest hit by last week’s floods in Iowa. I was able to go in Tuesday with the business owners and one of our Gazette photographers, Cliff Jette, for a firsthand look at the devastation. For those of you who went to Houby Days just a few weeks ago, the area is unrecognizable from the vibrant, festive place that it was. What we saw Tuesday looked more like a ghost town, with broken windows, jumbled piles of debris and gray dirt from floodwaters covering every building and every item inside. The National Czech and Slovak Museum & Library was the same, with layers of muck on the floors and mud-covered historical artifacts. Ironically, Tuesday would have been a community meeting to discuss the museum’s expansion plans. Now the focus is on cleaning and rebuilding. Some business owners plan to clean and reopen; others are unsure. I didn’t see the Sykora’s Bakery owner on Tuesday. I know some people have inquired about that. I want to mention one concern for people who are working on cleanup. When I was interviewing the business owners as they waited to get in to Czech Village at the area’s checkpoint, I bent down to talk to one of them and put my hand on the grass. For the next hour or so, until I could wash it off, my hand felt like it was on fire. Health experts are warning about the bacteria and chemicals in the floodwaters and all of that – the gas and oil, and whatever else washed out of garages and elsewhere during the floods – is now caked onto lawns and everything else it touched. Be careful. Wear rubber gloves when handling anything, as well as respirator masks when you’re going inside these buildings. CEDAR RAPIDS Rebuilding is the obvious answer for some business owners in the Czech Village. For others, answers will take time. Tuesday was the first day that owners were allowed to see the damage inflicted by last week’s catastrophic floods in the historic business area on 16th Avenue SW.
As was the case in many stores, mud-encrusted furniture was upside down and items were jumbled into piles by the raging floodwaters. Novak is one of the business owners unsure about his future. Rebuilding new elsewhere might be more economical, Novak added. The business, in the family since 1934 and in Czech Village since the early 1950s, lost furnaces, air conditioners and other inventory, plus two vehicles. Noting that June is typically Novaks’ busiest month and many people would need to replace furnaces that were underwater, Novak said the business is operating from a temporary shop and office. Nearby, Nan Barta, owner of the Saddle & Leather Shop, said she would do what she could to rebuild. The shop, in the family since 1946, has been a fixture in Czech Village since 1908. A 100-year anniversary celebration was planned for later this year. Cookie Vanous, 63, owner of Czech Feather & Down Co., echoed Barta’s sentiments. The business was started by her ancestors in 1875 and has been in Czech Village for 20 years. With the help of family, friends and Home Depot, which sent boxes and other materials, Vanous was able to remove nearly everything before the flood, including customers’ orders. Engineers will have to determine the structural soundness of the buildings, some of which had flooding near rooflines. Al Zindrick, 53, owner of Al’s Red Frog and Zindrick’s Czech Restaurant, hopes to reopen. Zindrick lives above the restaurant and was able to get his 92-year-old mother out before the floods came. Their cat was left behind with extra food and water. Czech Cottage owner Bob Schaffer left behind his parents’ pets in their apartment above the store. His mother, Jitka, 80, had lived through the Nazi occupation of Czechoslovakia during World War II. “I hope I’ll find three live cats,”” said Schaffer, 53, as he entered the store, a former pharmacy that has been in business for 33 years selling jewelry — which was removed before the flood — and Czech glass and other gift items. The building was built in 1901. Schaffer plans to reopen, but Mike Ferguson, 47, owner of the landmark Polehna’s Meat Market, was unsure. His priority Tuesday was finding a hazardous material crew to help remove thousands of pounds of rotting meat in the building.